Waterford County Museum's seminar / series of lectures on the War Of Independence and Civil War in Co. Waterford took place last Saturday 19th September 2009. The lectures were very well supported with almost 100 people attending them. The lectures themselves were very informative and did a very good job of reminding all present of why we should be proud of these men who fought to create the Irish nation. The only thing that could have improved the seminar was a better use of rest breaks. We were probably guilty of trying to fit too much into the one afternoon. As this was the first seminar that we have run we will just have to learn from our mistakes. In addition to the lectures, Terence O'Reilly signed his excellent new book 'Rebel Heart' and Willie Fraher unveiled the temporary exhibition the 'Road To Independence'. Many of the photos featured in this exhibition can be found online on our image archive. 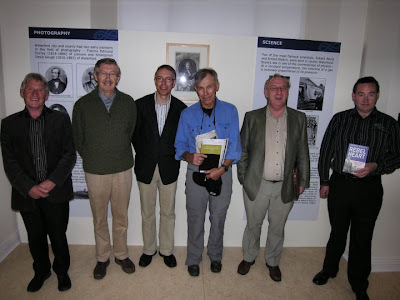 As a result of this exhibition we were very fortunate to get a donation of a '1916 Medal'. It was awarded to those who saw active service in the Easter Rising 1916. The medal in our possession was one of only two awarded to Waterford men. The exhibition 'The Road To Independence' will run in the museum on St. Augustine Street for the next two months. In addition to the medals we have many artifacts and pieces of IRA equipment donated by members of the public. Admission is free of charge. 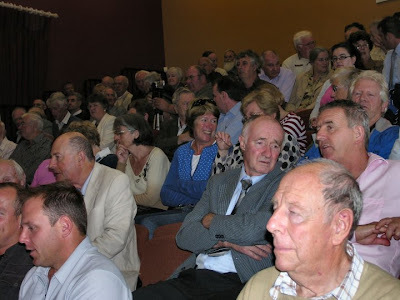 A view of the audience at our recent lecture series in Dungarvan Town Hall Theatre.